Global Conservation Force is proud to fund and mentor a new educational program in a rural elementary school in Vietnam. Wildhand is an organization founded and affiliated with Veterinary Department in Vietnam National University of Agriculture. This new set of wildlife courses will span from March to May complete with field excursions to local preserves for roughly 200 students. 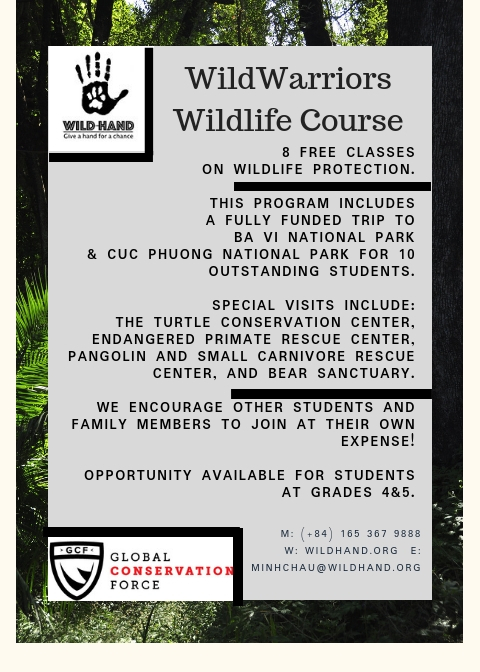 This immersive experience to Ba Vi National Park will allow these young students to build connections to natural habitats and species threatened by poaching in the area. Ba Vi National Park is the home of roughly 350 wildlife species, many of which have fallen on IUCN’s critically endangered or endangered lists. The majority of locals who are involved in conflicts with wildlife usually live near forests and have a low living conditions-this factor makes Vietnam one of the countries that utilizes high volumes of animal products. Equipping stakeholder communities with knowledge and opportunity will make it more likely to influence other generations both at home and at school effectively. Our educational mentors for this project are Education Coordinator, Lauren Lee, and Pangolin Project Coordinator, Lauren Ayres-Martinez. Their guidance helps fulfill the goal of this program-to bring awareness to the protection for wildlife. The mission of this program is to nurture, influence, and inspire our younger generations through first hand experience to appreciate wildlife, and be vigilant of the issues that they may encounter in regards to animal welfare.